I haven’t always been a healthy eater, believe it or not there was a time in my life where my favorite foods were chicken nuggets and bagels. My mom, she’s amazing, every night she’d make a delicious, warm, and healthy family meal; lasagnas, soups, stews – and me, well I put up a stink because all I wanted was a toasted cinnamon raisin bagel with cream cheese. Man, pay back is going to be rough with my own kids one day! Along the same lines, I always felt cheated as a kid that we weren’t allowed to eat all the sugary, colorful breakfast cereals that some of my other friends had every morning. And porridge!? Well that wasn’t even on my radar. Years later now and the thought of having a fruit loops for breakfast makes my stomach turn. I really don’t crave the same foods I did back then and I haven’t had a chicken nugget in years. I am so thankful to have been brought up in a home where we were taught to how to properly feed our bodies, to be wary of artificial foods and to always enjoy meals as a family whenever possible. Because what we put into our body – it matters. How we consume our food – that can make a real difference. And coming from someone who hasn’t opted for a bagel instead of a soup in forever, we can also change our cravings and our so called ‘sweet tooth’ into a ‘green tooth’ a ‘health tooth’ or a even, (gasp!) a ‘porridge tooth.’ The more we eat it, the more we crave it, or at least thats how things have worked out for me. Warm porridge is part of my daily winter routine, and switching out the oats for quinoa has become a new favorite variation of mine. It is really filling, warm and comforting, full of spices and nutrition, topped with juicy persimmons and toasty coconut – now, can a bagel offer up all that? I don’t think so! A hearty and filling warm breakfast for those cold winter mornings. For a quick midweek breakfast, cook a large batch of quinoa with spices and almond milk and keep in the fridge. It can be easily reheated in a little extra milk and topped with persimmons. Serves 2. Vegan & Gluten Free. A few tablespoon toasted almonds and coconut flakes, or other nut, seeds, dried fruits, etc. Chop one persimmon into bite size squares and add to a small saucepan over medium heat along with 1/4 cup water and spices. Simmer for about 5 minutes, until persimmons have softened. Once the spice/water liquid has reduced and is starting to get sticky, add the quinoa, remaining 1/4 cup water and 1 cup of almond milk. Bring to boil, and then reduce heat and simmer for about 13-15 minutes. Stir the mixture often, and then almost non stop for the last few minutes to make sure nothing sticks to the bottom and it gets ultra creamy. Once most of the liquid has been absorbed, remove from heat, cover and let sit for 5 minutes. Remove lid and stir. 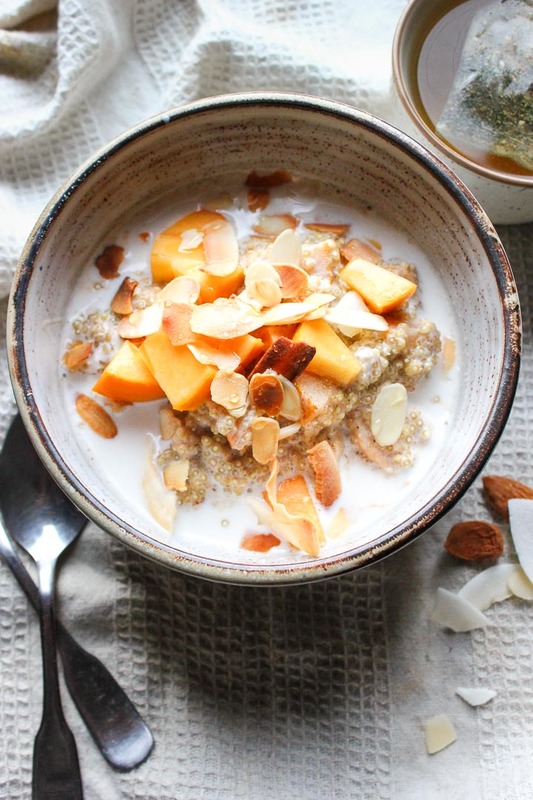 Divide quinoa between 2 bowls, top each with 1/4 cup almond milk, fresh chopped persimmon, toasted almonds and coconut. Drizzle with honey or maple syrup and serve warm. If you’re just eating one serving, the leftover quinoa can be kept in the fridge for a day and warmed up with 1/4 cup almond milk for a quick breakfast the following morning. This porridge looks awesome. I’d love to warm up to a bowl of this on a horribly cold morning like today. With the cold weather setting in, I, too, like to eat oatmeal in the mornings, so this is a nice idea to mix it up a bit – thank you! 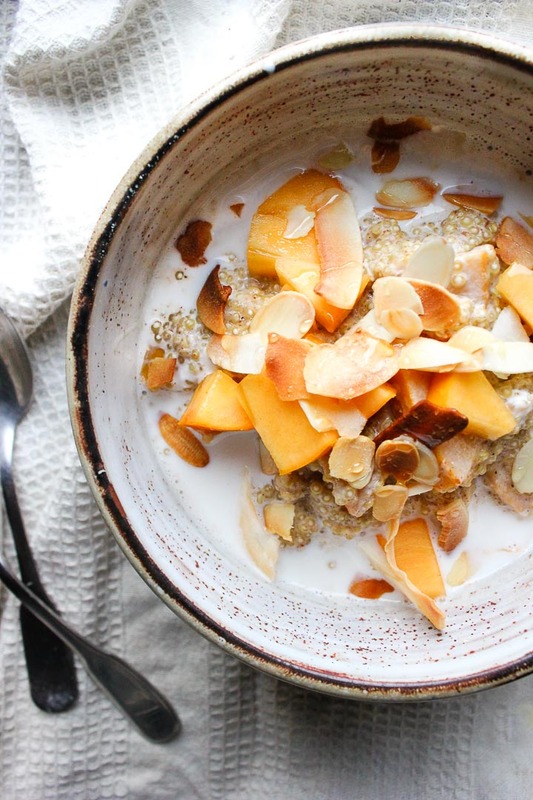 Persimmons and coconut flakes are my current jam! And of course quinoa and almonds are always in my life. Happened to use some cardamom this weekend too. Sounds like the perfect breakfast! Thank you for sharing! Have to try it! On Friday the British national newspaper the Daily Mail ran an article on Porridge. As part of a food series exploring the ‘perfect versions of classic dishes’ Felicity Cloake explored how to make the best breakfast!